It was a weekend of sorrow and agony in Ekiti State. No fewer than 15 people were dispatched to their early graves on Saturday night when a truck veered into a market in Iworoko-Ekiti, Irepodun/Ifelodun Local Government Area of the state, according to residents of the area. of the town. In the ensuing chaos, it crushed three shops and a commercial mini bus which had some passengers on board. One of the shops, a barbing saloon, had residents and students charging their cell phones inside it. They were all trapped in the accident. Among the 15 persons killed were students of the Ekiti State University, (EKSU), a corps member, residents, traders in the area and a mother and her child. The on-going strike by the Academic Staff Union of Universities (ASUU) inadvertently prevented more deaths and saved many students of EKSU from perishing in the incident. Residents claimed that the market, which the truck ran into, was always crowded with students when the school was in session. When Daily Sun visited the scene of the accident on Sunday morning, a huge crowd of sympathisers had gathered at the scene with some wailing while others cursed profusely. The trailer crushed a commercial minibus popularly called â€˜akoto.â€™ Bags of rice, some of which had posters of the senatorial candidate of the All Progressives Congress (APC) in Ondo State, Tayo Alasoadura, littered the scene. A bereaved youth, who was wielding a cutlass, suddenly began cutting open the bags of rice, throwing away their contents. But for the intervention of some elderly people, he would have destroyed all the bags of rice in anger. The mob at the scene chased away a towing truck of the stateâ€™s transport office, which got to the market by 8am, saying that it had come too late to rescue the victims. They stoned the vehicle, forcing the driver to zoom off. They also made attempts to chase away the advance security team of the deputy governor, Bisi Egbeyemi, but were intimidated by the presence of heavily-armed security operatives who later escorted to the deputy governor to the scene. Speaking with the chiefs and angry youths of the community, the deputy governor, who represented Governor Kayode Fayemi, said: â€œThe state governor condoles with the families of those who have lost dear ones. We pray for their souls to rest on peace. Government will also ensure that those who were wounded have their hospital bills taken care of. We will also take care of other things. Egbeyemi, who also visited the Ekiti State University Teaching Hospital in Ado-Ekiti, where the dead and the wounded were taken to, told the doctors to begin urgent treatment of the wounded. He assured them that the bills would be paid by the state government. The hospital management told reporters that 12 bodies, including some students of EKSU, had been deposited at the morgue, while four of the wounded victims of the accident were receiving treatment in the hospital. A leader of the tipper driversâ€™ union in the state, Ganiyu Tijani, opined that the driver must have dozed off before the trailer-truck rammed into the market: â€œI want to believe that the driver of the truck must have slept off. If not, he would have been able to manoeuvre the truck and hit the culvert on the road and prevented this tragedy. â€œThe fact that the vehicle jumped over the road and ran into the market speaks volumes about the driverâ€™s carelessness,â€ he said. Wailing profusely, a grandmother and one of the sympathisers, Raliat Karimu, mourned the death of one of the victims, a woman identified simply as Funmilola. 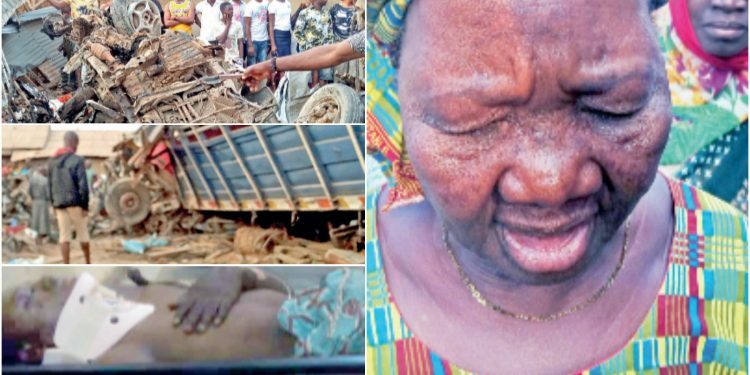 She said Funmilolaâ€™s son also died, and her granddaughter was injured. The grandmother lived at 5, Layelu Street, Iworoko, one of the buildings behind the three shops demolished by the truck. Madam Karimu said: â€œWhen the accident occurred, witnesses came to inform me that my relative, Funmilola, mother of a young boy, died in the accident. Her boy also died. His name was Olu. Her granddaughter, Titilayo was seriously wounded and is in the hospital now. She was selling pepper and foodstuff at the marketâ€ she said.